Although I have long known of Georgette Heyer, Lady of Quality is the first of hers works that I have actually read. I was worried that it would be a letdown, after so much hype about her stories, but thankfully that wasn't the case. I loved every minute of this tale. The world building and historical detail are excellent. Meanwhile the characters are all larger than life and perfectly portrayed. None of the characters are faultless, and that made me love them all the more. The plot is fairly predictable, of course, but it was still a joy seeing the characters make their way from start to finish. I have two more of Heyer's books here waiting, and I look forward to reading them soon. 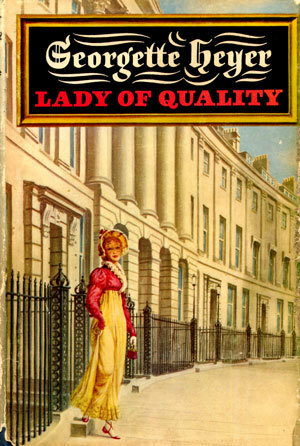 If Lady of Quality is anything by which to judge, they should be highly entertaining. A solid 4.5 stars from me.